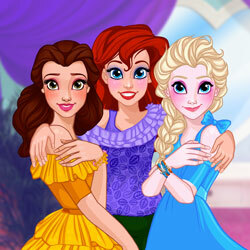 Description: We have three princesses and a challenge! These princesses need to go to your beauty salon, do you think you can do this? You'll have to choose the perfect make up for each princess, dye their beautiful hair and style it, and then do their manicure and apply nail polish. If you complete all stages, they'll take a beautiful selfie together and make your beauty salon famous!